Learn the skills of working with coloured Pastillage to create an elegant jewel box decorated with pressure piped ‘Jasper’ style figurines. 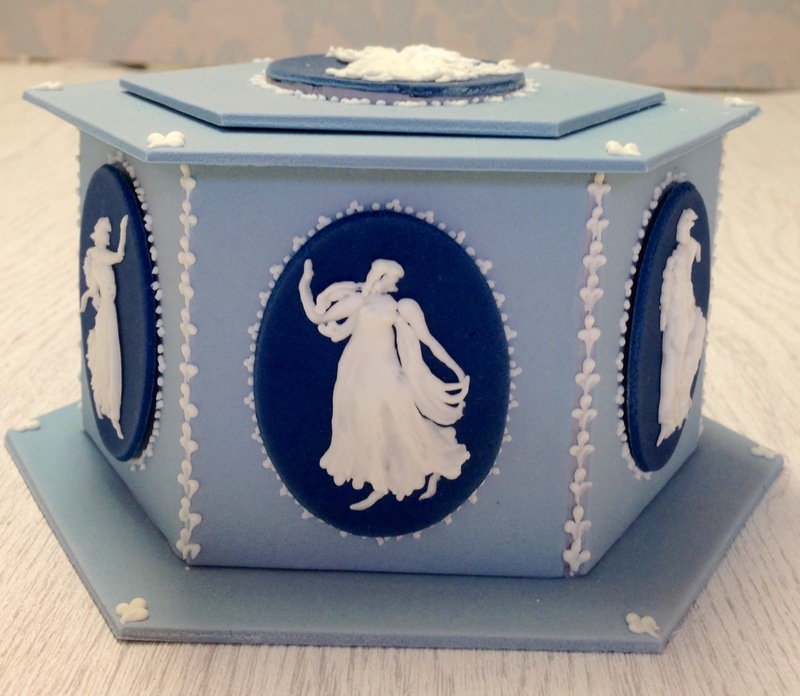 A beautiful sugar box to hold your special sweets. Everything you make is 100% edible. This is an advance Royal Icing piping skills class so moderate experience is needed. The course is also longer to allow more practise time. At the end of the course you will have a beautiful Pastillage box to take away and enjoy. We will supply you with all recipes and refreshments throughout your course and there is no need to buy any equipment as we supply everything you need to use. Please see our Facebook page for up to date courses. Please call us on 01474 816659 or email info@fruitcakefactory.co.uk to book your place. • Learn how to design templates. • Manufacture our hard drying Pastillage. • Learn the techniques of handling paste, cutting it and drying it..
• Learn the preparation for construction. • Learn how to pressure pipe figures. • Learn how to colour Pastillage. • Learn advanced piping skills. Be the first to review “Wedgewood Jasper Style” Click here to cancel reply.